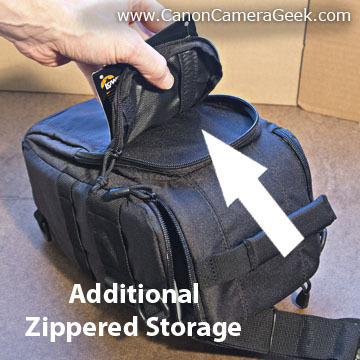 Are you looking for a good Canon top loading camera bag? You want something that fits just right and won't cost you a ton. 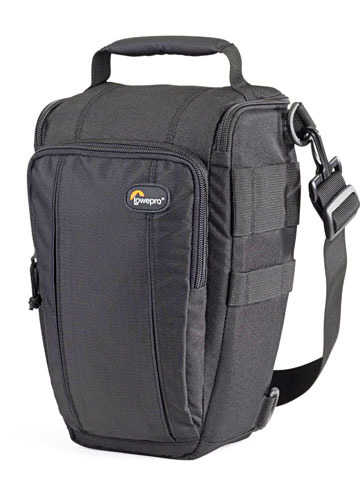 I gave this top-loading digital camera bag a 5 thumbs-up rating despite the fact that I had to return it. That sounds odd. Let me explain. I was searching for the best top loading camera bag that would give me easy access to my Canon 5D and 70-200mm f2.8 while hiking the trail. I purchased the Lowepro Toploader 55 AW. Top loading camera bags like the 55 AW are good for giving you quick access to your camera and lens and small accessories without setting your bag down. 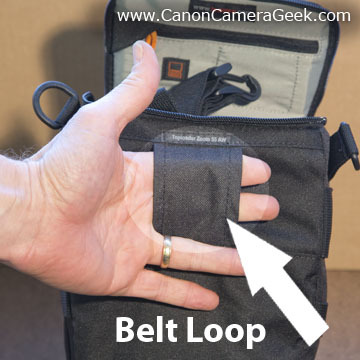 I already had a waist-mounted bag for quick access to one camera and my Canon 24-105 lens. I wanted to add a camera body with a longer telephoto for getting quick shots of wildlife. I rated it based on buying it, examining it closely and evaluating it for its intended purpose. Here is my disclaimer though. It will only be right for you if it is the right size. I needed it to fit my Canon 70-200 lens attached to my Canon 5D Mark III. It failed on that one. In fact, size is usually the biggest complaint when it comes to top-loading camera bags. I am an Amazon review-reading junkie and there are often complaints about top-loaders that say it is too small and others that say it is too big. If I had forced it, I could have zippered the lid down but it would have put excess stress on the bag. That's the mistake that I made this mistake with my shoulder bag a few years ago. I over-stressed the zipper on the main compartment, broke it, and made my bag useless. 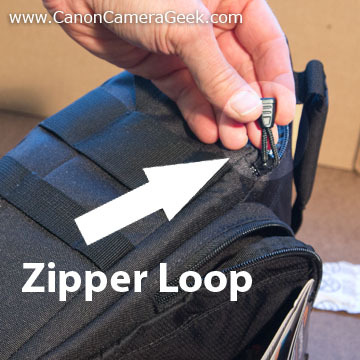 The loops on the zipper handles are one of those little detail features that impressed me about this bag. The Lowepro Toploader has a zippering handy memory card holder under the lid. You could also store a spare battery in the zippered area. The Lowepro 55 AW also has a double side loop for attaching a mini-tripod or monopod. Using the belt loop will help in two ways. It will prevent your bag from swinging around and banging in to anything and will also take some of the weight off of your shoulder. 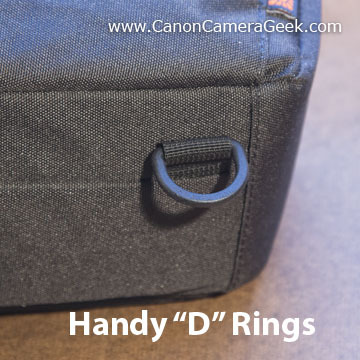 The "D" rings are a good design and are included on top and bottom of the Canon Top loading camera bag. 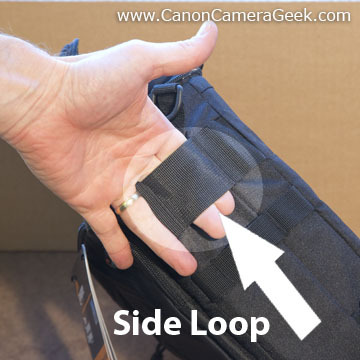 One other potential shortcoming for some photographers could be the width of the shoulder strap. It is not particularly wide and is not padded. I have several other thickly padded straps that I can substitute for the included strap if needed. This bag is designed to hold just one camera-lens combination so it will not weigh that much on your shoulder when loaded. 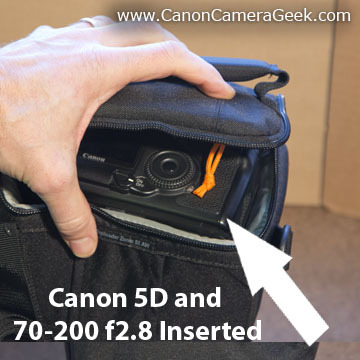 I didn't keep this as my own best Canon top loading camera bag because of its size, but it might be the right one for you. You can always get it and see if it is the right size. It was so easy to return it to Amazon for a full refund. You can get more opinions by reading the reviews on amazon about this top loading bag as well as others. Click the Amazon link to find out more. 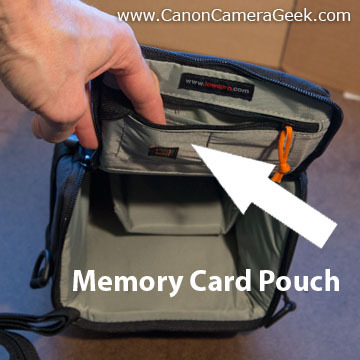 Zippered pouch is great for a memory card or spare camera battery. 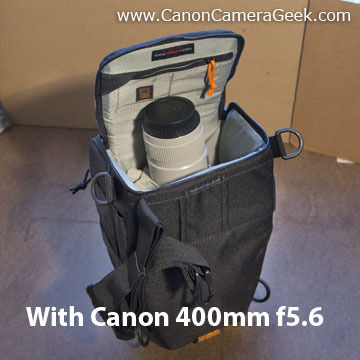 The Canon 400mm f5.6 Lens is simply too long to fit in this camera bag. 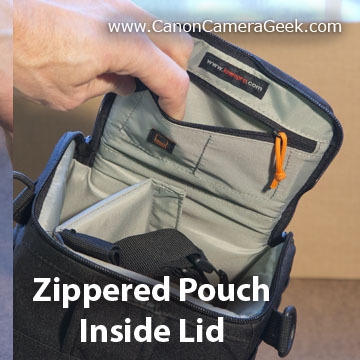 The additional external zippered pouch would be good for your cell phone, a trail map, your car keys, or camera manual. 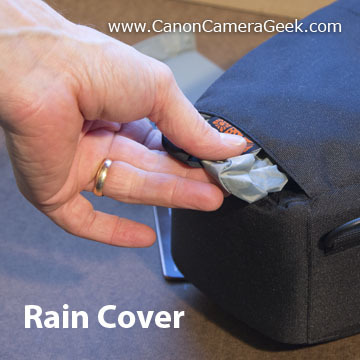 The rain cover was easily slid out from its own Velcro storage flap.